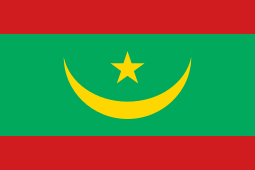 The flag of Mauritania is a green field containing a gold star and crescent, with a red stripe at the top and bottom of the field. The original national flag was introduced under the instructions of President Moktar Ould Daddah and the constitution of 22 March 1959 and was adopted on 1 April 1959. On 5 August 2017, a referendum was held by President Mohamed Ould Abdel Aziz to change the national flag, abolish the senate, and other constitutional amendments. The referendum was successful, and the new flag, including two red stripes, which represent "the efforts and sacrifices that the people of Mauritania will keep consenting, to the price of their blood, to defend their territory", was adopted in for its first raising on 28 November 2017, the 57th anniversary of Mauritania's independence. Green, gold and red are considered Pan-African colours. Green is also used to symbolise Islam, and the gold is for the sands of the Sahara desert. The red stripes, which were added to the flag in 2017, represent "the efforts and sacrifices that the people of Mauritania will keep consenting, to the price of their blood, to defend their territory". The crescent and star are symbols of Islam, which is Mauritania's state religion. Some writers have also speculated that green symbolises a bright future and growth. There is no official specification or construction sheet for the exact relative measurements of the star and crescent, although the flag's measurements are 2:3. The design acts as the national flag of Mauritania and is also used in circular form as an aircraft roundel. Although the constitutional amendments only mentioned the addition of red bands, officials have been using different flag's models since the change in 2017. Unlike the seal, the exact flag is specified, not merely the right for a law to specify it at some later date. However, the flag has its official basis in the earlier constitution of 22 March 1959; no changes were made when the country declared its independence in 1960. In 2017, a red band at the top and bottom were added to symbolise "the efforts and sacrifices that the people of Mauritania will keep consenting, to the price of their blood, to defend their territory", in a referendum on 5 August 2017, scheduled by President Mohamed Ould Abdel Aziz which contained among other constitutional amendments a modification of the national flag and anthem. First scheduled as part of a single vote, these changes proved controversial enough for them to be made into a separate vote the same day as the vote on institutions. ^ France: Colonial Empire at Flags of the World. Jaume Ollé and Nozomi Kariyasu, 17 June 1998. Accessed 27 August 2009. ^ a b c d e (Flag of) Mauritania at Flags of the World Accessed 27 August 2009. ^ L’Assemblée nationale adopte le projet de loi portant description du drapeau de la RIM, Agence Mauritanienne d'Information, 12 October 2017. Accessed 28 August 2018. ^ Pan-African Colours at Flags of the World Accessed 27 August 2009. ^ a b "Mauritania - Constitution". International Constitutional Law. 12 July 1991. Retrieved 27 August 2009. ^ Whitney Smith (2001). Flag lore of all nations. p. 62. Available at Google Books, here (accessed 27 August 2009). ^ "Mauritanie: un référendum pour supprimer le Sénat, changer de drapeau et d'hymne" [Mauritania: a referendum to abolish the Senate, change the flag and the anthem] (in French). afrique.le360. 4 November 2016. Retrieved 16 November 2016. ^ "Mauritania votes on controversial constitutional reform". Al Jazeera. 6 August 2017. Retrieved 6 August 2017. Wikimedia Commons has media related to Flags of Mauritania.